And we’re back. Two of the more unusual lists in Epic: Armageddon and the finest of the priests of Mars on display. Aside from the preponderance of war engines there’s not a lot directly unifying the lists this week so we can skip the general overview and get into the list details! Note that these lists can work for Chaos too, there’s not a lot of the uniquely chaos stuff in there but a decent paint job will work wonders for playing to theme! The unstoppable might of the Titans can be fielded as an entire list that plays out in a very different way to basically everything else in Epic: Armageddon. It’s a great list and is well balanced able to win games whilst simultaneously being far from undefeatable. It is also great if you’re not confident of painting small 6mm figures (but you could be, Painting 6mm EPIC Armageddon miniatures) or just don’t want to paint that much stuff and 4 or 5 ‘centerpiece’ models is more your style. The list has some breaks with standard Epic features, the biggest being that weapons/units named the same thing have consistent stats across every list that uses them. 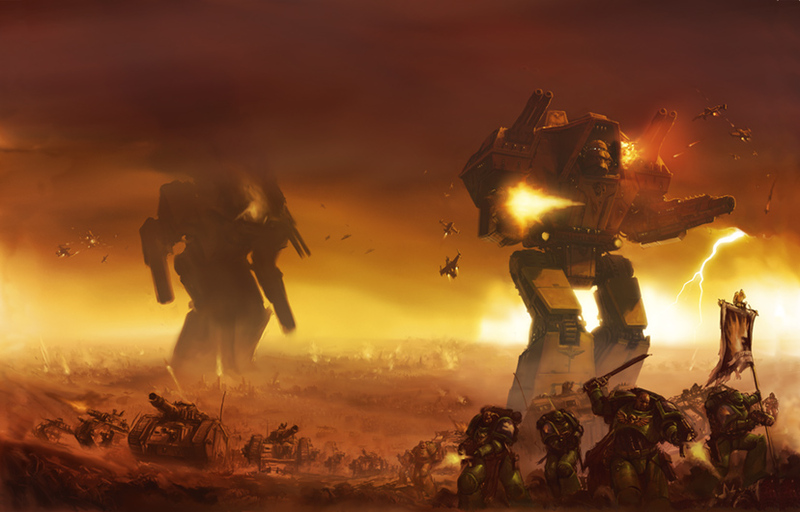 The AMTL Titans armed with the same weapons as an identical Titan in a Space Marine or Imperial Guard list will have a different weapon stat line. An even more powerful weapon stat line. This may be mildly confusing so make sure you are using the AMTL version of the units and weapons when playing AMTL and not the generic ones from the other Imperial lists. This break from standard to give more powerful versions of each weapon is because the titans needed the additional power to make sure they were competitive when used en-masse, otherwise they suffered from very low activation counts and needed to have the ability to utterly shatter an enemy each time they attacked. Hence the ‘upgunning’. You also get to custom equip your titans with different weapons and load outs to alow them to specialise for different roles. This is essential when planning out what you’re going to do. You need to plan out how you’re going to score or defend the objectives that will give you a win and equip your titans to achieve them. So, what do you see in Titan Legion lists? First up is a very small activation pool. 4-5 activations is very common which is dramatically fewer than practically everyone else. You need to leverage your activations when you can and you need to get a supreme commander reroll on activation if you can. While you default to 1+ once you pick up blast markers you can find yourself activating on a 2+ and having that fateful failure to activate when you only have 4 is huge. You also need to think about how you’re going to fight for the objectives, you really can’t spread out to cover lots of ground so placing yours in positions you can easily reach and contest multiple at once is recommended. 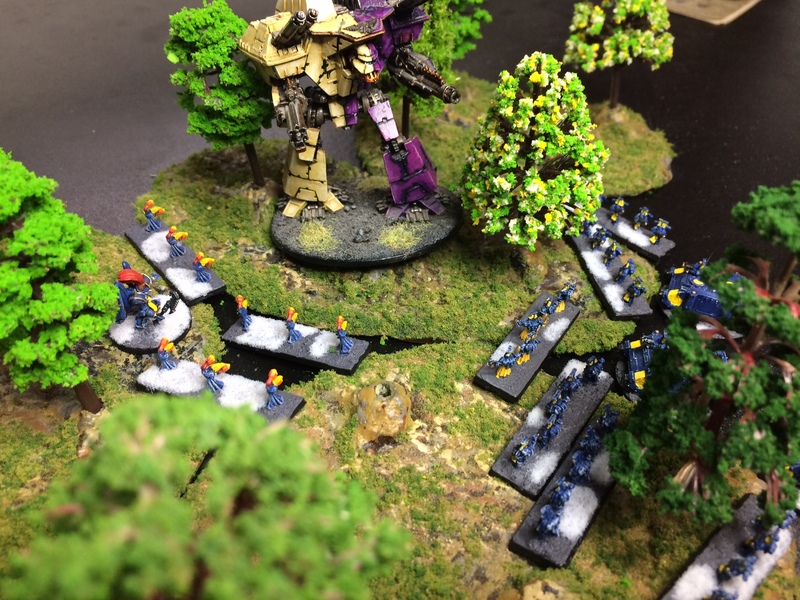 An ambush is sprung, the Warlord is isolated and vulnerable to combined enemy forces! You’re also very slow, exacerbating the few activations and difficulty covering ground. You will need your objectives close to the center line of the table so you can reach them to contest them! The Reavers are better on the offence due to their faster ground speed so often these are used to double across the table to the enemy blitz and have a pair of heavily armed, upgunned, shielded, multi-DC titans standing on it at the end of turn 3 while Warlords tend to the more defensive roles, protecting the blitz and sitting on the two objectives you placed on the half way line at the end of turn 3. There are some faster, smaller and cheaper elements available, notably aircraft and warhounds. These can be effective but you need to very carefully think about how you will use them. because most opponents will lack the equipment to reliably take on and destroy the full size battle titans but will have the tools to destroy these smaller elements you will likely find that your warhounds and planes get shot down swiftly before they can do a lot that is useful which leaves you with even fewer activations. Broadly you’re aiming to start with 4 activations and end turn 3 with 4 activations while your opponent has lost many of theirs as you blew them away. The smaller titans and formations run counter to this by making it far easier for the enemy to remove your activations and cripple your attack. It is also worth remembering that all the titans have the Walker ability, giving a reroll on difficult terrain tests. This means you can stroll into and out of cover and should do so to cut the fastest route to your destination and to claim the -1 to hit cover bonus. You’re going to come under heavy focus fire so that -1 to hit is very helpful and you only suffer a wound on double 1s so 1 in 36 chance…Inevitably you will roll this at some point, roll to go critical on that single DC and then have a plasma reactor meltdown and explode horribly because you decided to walk through some trees but those are character building moments and worth it to have that story to tell! Don’t let that risk make you leave your titans in the open if they can avoid it! remember also that you can see through terrain features that you are inside (up to 10cm) so you can see enemy hidden on the other side rather than having your LoS be blocked. Another hint is to keep your titans close together, within 15cm support fire range (but not too close, don’t get within 5cm of each other as that risks being intermingled and having multiple titans get broken!). Most people have a plan and tools to deal with one big super heavy on their opponent’s side. few have them to deal with 2 at once! You need your actions to succeed each time you commit to performing them (you might only get 12 activations across the entire game!) so sometimes having two titans in support of each other to make those ‘guarantees’ more guaranteed is worthwhile. Also apart from being destroyed having your titans broken (either by losing an engagement or through sheer weight of blast markers) is a very dangerous situation. You will have a 50:50 chance of having them fail to rally (Init1+, broken makes it 3+ and your opponent will make sure to get something within 30cm for another penalty for 4+ to rally) which takes an entire large chink of your army out for another turn! Use of the Marshal order (to clear blast markers and repair shields) is highly recommended and sometimes that means sacrificing the chance to shoot in favour of moving to where you need to be. You need to pay attention to how you will score the objectives and sometimes giving up the cathartic experience of firing away with your guns in favour of getting into range of the objectives is more important. Or was it all just a ruse and the Warhounds ready to counter ambush! Generally you will probably find you are getting close wins or close losses and a good handful of draws. It’s difficult for you to score many of the objectives and difficult for your opponents to take your guys down. 2:1 wins or losses turn 3 are the most common result for Titan Legions and wily opponents will know this and keep elements hidden or in reserve to dash out and contest things at the end of the game to stop you scoring. At broadest brush the Imperial Knights are kind of like Titan Legion-lite. Fewer formations of very potent models. However this translates to a very different army in practice. 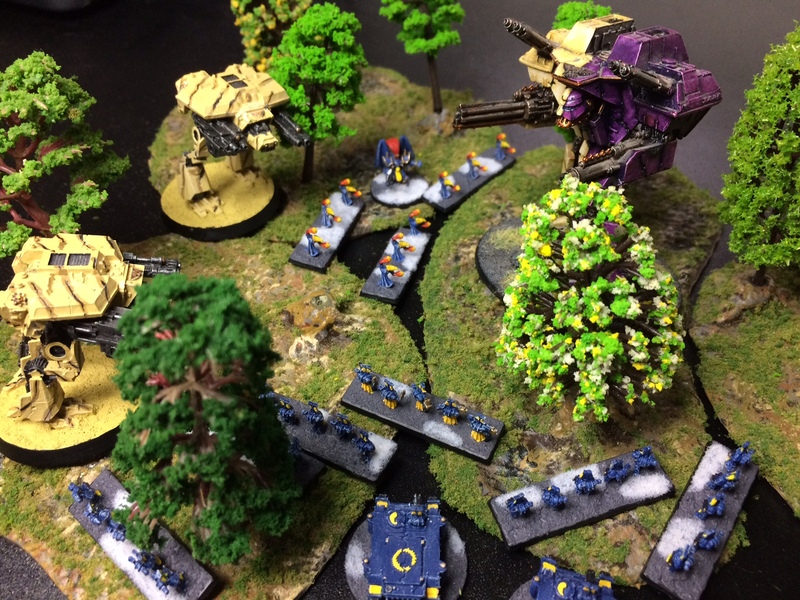 They lack the formation destroying firepower, are more vulnerable to the weaponry of your opponent and need to operate with support in engagements to defeat your opponent. In return they are more numerous, faster and bring along some fantastic cheap support elements. 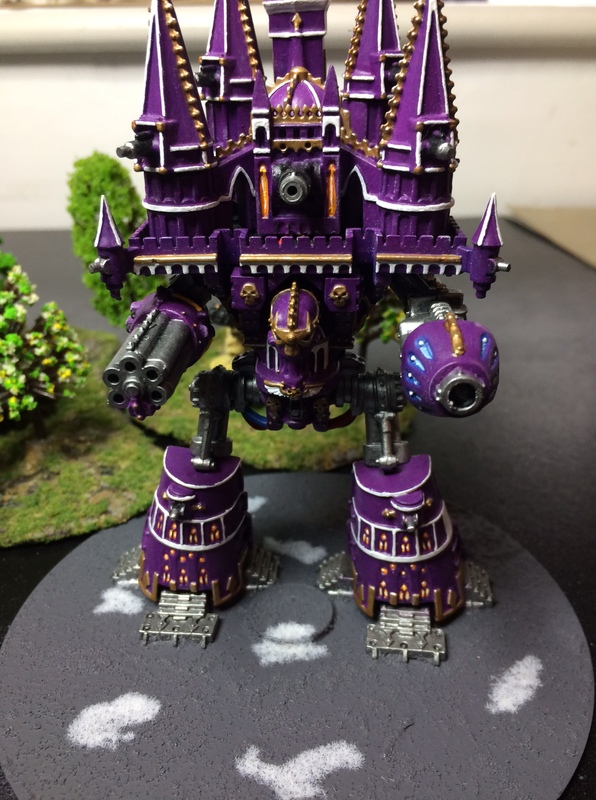 The core of the list is the Knights (of course) which come in a few varieties, from long ranged fire support (with both Macro cannon and Barrage weapon options) of the Castellan and Crusader to the firefight specialist Lancers and the more standard Paladins who excel in both roles. The individual Knights are pretty tough, shrugging off light fire but they need to keep a careful eye on where the opponent has massed firepower and will want to take advantage of line of sight blocking terrain or claiming cover if they need to because they don’t want to be subject to enemy fire more than they need to be. DC2 is good, but won’t handle sustained anti-tank firepower, especially from the opponent’s dedicated anti-tank or anti titan weaponry! Luckily you have a lot of mobility at your disposal, 25cm moves on small model count formations means you should be able to dart from cover to cover and only expose yourself to enemy fire if you want to (for example to take your own shots first!). Getting forward with your Paladins with some Lancers nearby to engage or support is recommended. Put pressure on your opponent’s forward elements and remove scouts or other mobile elements when you can. You want to strip away any activation count advantage they have by bullying the cheaper, smaller formations they have taken to bulk them out whilst avoiding getting tangled up with the core combat formations of their army. You want to be setting up late turn 2 or turn 3 engagements with supporting elements to break your opponent’s main combat elements and avoiding them otherwise. Your more ranged firepower focused Knights (Castellans and Crusaders) should be weakening these core combat formations or taking out bigger, stronger elements and ideally preventing them from being able to hunt your Paladins and Lancers. Later game sacrificing these shooting focused Knights to set up your Paladins and lancers for decisive engagements is worth it. Your other knights still carry battlecannons and so are capable of blowing up lighter troops at long range reliably. Aside from the Knights dashing about the place bullying your opponents troops before engaging en-masse for the hammer blow you have access to the various imperial militia, planetary defence forces and other less ‘famous’ units that form the core of imperial forces away from the guard, marines and the like. These elements are not exactly stellar but they are cheap and have some great uses alongside the knights. The highlight is the imperial light artillery, the 90cm indirect firing guns and tractors for a mere 150pts is exceptional value. Deploy these in cover and out of sight somewhere they can shell deep into the enemy half. Then just keep firing, even if they don’t deal much damage their ability to reliably and safely put blast markers on the enemy formations means you can ‘prep’ the enemy for an engagement without having to ‘waste’ a knight formations on that job. 8 models too makes them decently capable of absorbing a bit of fire and holding objectives or ground and with their tractors they can be surprisingly mobile. Sadly the rapier light guns are less impressive, basically being the opposite of the light artillery but critically missing the indirect fire capability they are just much more vulnerable and the anti-tank duties can be covered by your knights more efficiently anyway. Siegfried light tanks are extremely useful as a tougher scouting formation, use these to make sure you have room to advance up the board with your knights early and to deny good ground to your opponent’s garrisons. it can be worthwhile keeping these guys fairly close to one another rather than spreading out like other scouts because they can be an effective engagement tool to drive away strung out enemy scouts. Many scouting units lack anti-tank weaponry too (lots of AP, not so much AT) so you can use the fact siegfrieds are armoured vehicles to draw out overwatch shots or get into shooting matches with scouts and come out on top. Don’t overestimate these tanks though, 6 scout tanks is not a match for anything that is a real combat unit, leave them to focus on normal scout duties and to bully other scouts. There is less of a need to worry about being laser focused on objectives like the AMTL. The Knight army plays more like a conventional Epic army with just a few more hammers than anvils so many of the lessons learned from other armies can be applied here. The biggest thing to watch out for is psychology (both human and game rules!). Your army has a real lack of leaders and few models despite DC2 being common. This means that once you start losing models you lose a lot of ‘bulk’ and can break quickly and getting rid of the last blast markers on your formations is tricky because you don’t have easy access to leaders without making trade offs for more models or formations. The human psychology element is to be careful not to get overconfident in your knights. They’re better than normal formations but their stats are not crazy high, lots of 4+ and 5+ values amongst their attacks so it’s not unlikely to find an attack stalling out once a few models are down because you can find yourself making only a handful of 5+ attacks. You can, of course, play up the intimidation factor of smashing 6 war engines into your opponents to try and make them be more conservative in fear of your armoured reprisals though! Talk up your knights while no forgetting you need to be careful about exposing them to harm! Like the sound of Heavy Metal Thunder? Welcome to the Skitarii. You can have massive armoured warengines carry bizarre weapons plucked from the mad minds of the tech priests of Mars, infantry wrapped in steel and mounted in even more steel. You can have a lot of scary offensive firepower, can absorb fire on your void shields and deliver strong infantry formations into the enemy from the safety of Gorgon transports. Few opponent’s will have the raw firepower needed to deal with this large a number of ough war engines and you can use this to pressure them hard and early, striking from range with your specialist weaponry. Look to be on the offensive, you want to be on the halfway line ASAP to block your opponent’s ability to move around and set up their attacks while giving your the initiative to launch yours. Because the downside to all of this armour and firepower is psychology and initiative. You’re definitely tough, but you’re not impervious to harm and you’re not especially abundant. Weight of fire and positioning can leave your armoured formations reeling and broken and carrying blast markers even if they do rally and if you’ve spent your points on this heavy armour then you probably have notably less of the foot slogging grunt infantry to absorb the enemy and launch attacks of your own. Raw firepower in the shooting phase rarely wins Epic games outright so you need to be prepared to engage. Exacerbating the psychology issues is the lack of ready access to leaders on the war engine formations. A pair of Minoris sets you back 300pts, is not great in an engagement (4×5+ attacks) and only really excels in the shooting phase when it can bring its big guns to bear…but if one gets destroyed then the other one breaks immediately and, even if it rallies later will be carrying 1 blast marker…it only has DC2 so if it gets shot at at all (even if no damage is dealt) it will break again. Going for 3 strong formations is a viable alternative but this quickly racks up cost, especially if you upgrade their weaponry. 425pts to 500pts if fully upgraded is a lot an won’t leave much room for the rest of your army if you go too heavy on these! You need to be preventing your opponent from getting the initiative, force them to be responding to your attacks. Identify when they are setting up their attacks, what they will attack with, etc. and either move to make this difficult or blow it away under a hail of fire. This is why going too defensive early on can hurt you – you can lose the room you need to escape into or find yourself unable to get your forces into blocking positions and also you give your opponent the time they need to set up their attacks behind cover. The abundance of Void Shields and poor handling of blast markers combined with potent long ranged weapons and many Slow Firing guns means that the Marshal order to clear blast markers and repair shields (and shooting or moving if you have slow firing) is a good option. This again works better if you have pushed up the table to the half way point. marshalling turn 1 leaves you a long way from the action and objectives but doubling up turn 1, then marshalling turn 2 can keep you strong, shielded and present right in the thick of the action. All this talk of warengines however may have distracted you from your infantry. These guys are good. Maybe not mind-blowingly standout compared to other factions out there but the core Hypaspists are reliable and come in large formations for relatively little cost. 10 stands mounted in a gorgon is 300pts and can absorb a lot of punishment, has a leader and can carry a lot of blast markers before succumbing. You have to take some of these to unlock your other formations anyway so it’s worth considering what you’ll do with them. Having them drive alongside your main armoured thrust and dismount to block enemy attack routes or be in support fire positions is one such use. The Sagitarii mounted in a Gorgon are 250pts (300 if you add the rapiers) who can perform the same role or be your offensive spearhead. The alternative to mount in Chimera gives you more speed and, despite these transports being more vulnerable to enemy fire than a Gorgon can be easily protected by hiding behind the other war engines you have brought – remember, war engines block line of sight so placing the chimera behind a minoris means they can be seen to be shot at! 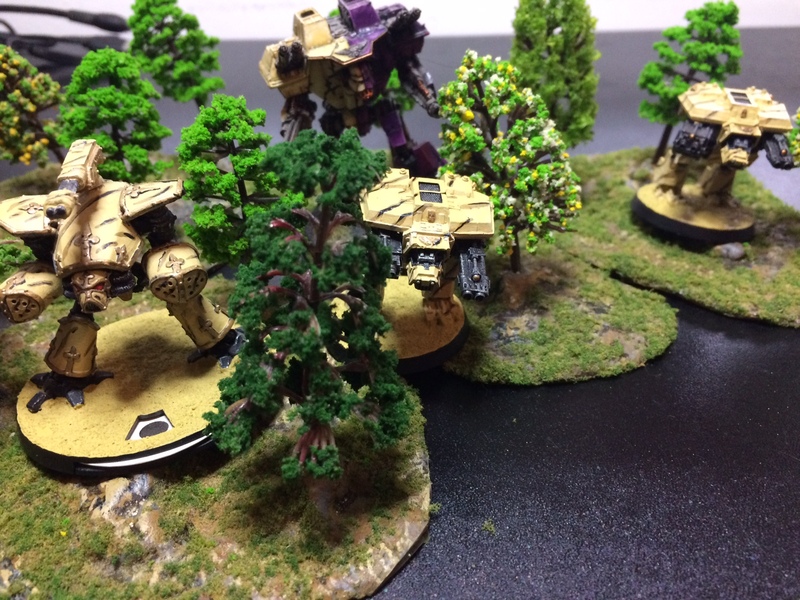 You may have noticed a lack of scouts or cheap stuff so far – 300pts is a common number. You do have options here though. Taking Sagitarii without transports is 175pts for 5 decent models who can garrison forward. The Robots formation similarly is able to garrison and take some punishment while there as well as pour out respectable fire. Robots especially are good for dealing with enemy garrisons or scouts. Broadly you play Epic like other armies, just with a particular set of idiosyncrasies. Powerful war engines and guns backed up by competent infantry but, maybe, just lacking that one killer attacker. One other bonus for the Skitarii is the mad-science of the tech priests of Mars themselves. You can guarantee that someone, somewhere can made their own variant or version of any given vehicle so you can convert, scratch build and proxy in all manner of things to be whichever mad creation you want to field, perhaps only the Orks have more carte blanche to make their army their own! Hopefully there’s something to entice you to one of these lists or maybe just as helpfully helped you chose not to pursue one of these. I ran a Skitarri list at the McPocolypse Now tournament yesterday. The stand-out performers were hands down my Praetorians. If you can get them into CC they can tear the meat out of most formations and they’re great for initiating assaults in FF. In FF they don’t do much damage themselves but their 3+/6++ save is great for surviving the enemy fire and enabling the supporting fire of nearby Hypaspists. The army is relatively slow and doesn’t have the fancy tricks of some, like air assaults, teleport, scouts, etc which makes them a bit of a grinding army, but in a battle of attrition they’ve got a good chance to simply outlast the for.